Caption slip reads: "Photographer: Mercurio. Date: 03-11. Reporter: Ostler. Assignment: San Gabriel Valley Tabloid. Chaffey Junior College Orchestra --- Ontario. 41: Donna Barrick, 21, of Fontana, a student of Chaffey Jr. College, seen playing Timpanies. She is, according to school officials the only timpani player in San Gabriel Valley. 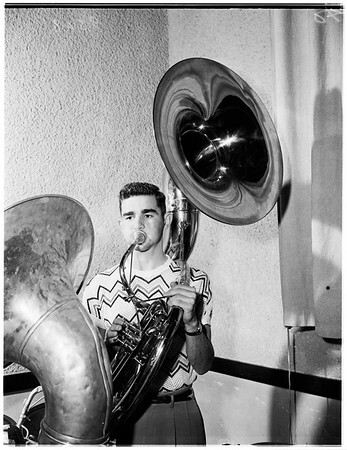 40: Don Harmon, 18, 633 East 4th Street, Ontario, practicing on his E-flat sousaphone in preparation for school benefit concert at Padua Hills theater in Claremont. 2: Flute section: Windy Hayward, 16, of 1944 West 5th Street and Letty Maurer, 16, of 423 Princeton Street. 158: Gen. view of part of Chaffey's 80-member Symphonic choir. 5: Gen. view of Chaffey Jr. College Symphony Orchestra. Jack Feeney is conductor, 6: Chaffey's cello section: L - R: Carol Davis, 15, of Upland, Donna Kirk, 15, 1201 East 8th Street, Ontario, and Joy Galitz, 14, of 416 Rosewood Court".